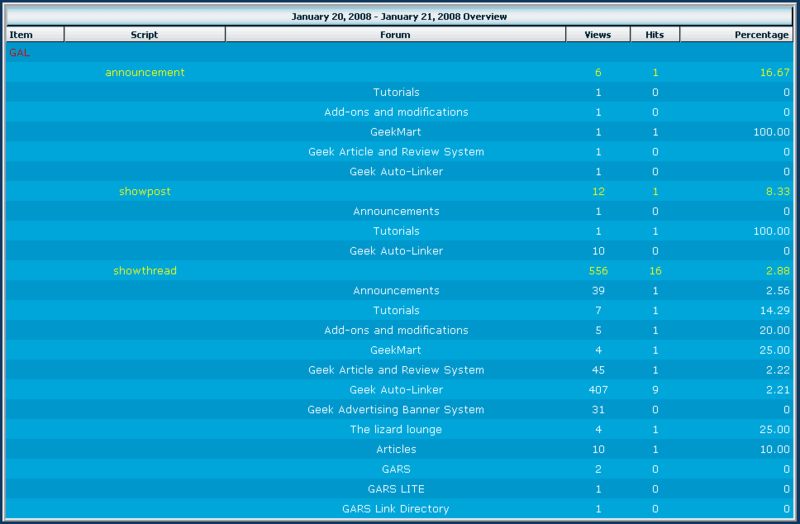 GAL is a highly configurable system that dynamically links keywords in posts. The types of links can range from simple and standard to enhanced links that create pop-up boxes when users hover over them. Ideal for an in-line glossary or useful links GAL is even more ideal for advertising! With GAL you can track the impressions of keywords as well as how many times people are clicking them! GAL has a built in stats viewer that allows you to quickly and easily gather statistics on any single item in an instant! GAL requires vBulletin 3.6 or later. Not for use with large forums. Enables you to download GAL. Enables you to download brand free GAL. Are you a 'brand free' kind of site? Then this is the option for you! A brand free purchase gives you the right to not display the GAL copyright. Renews your GAL license for an additional year.